Flowers have such a wonderful way of lifting your spirits. It’s always nice to receive a gift of flowers, whether it’s meant as a token of love, friendship, sympathy or apology. But aside from the occasional bouquet you might haphazardly toss in a vase, you can also use floral arrangements as design elements throughout your home. The beautiful colours and varieties of sizes and textures available can make stunning visual statements in any room of the house. 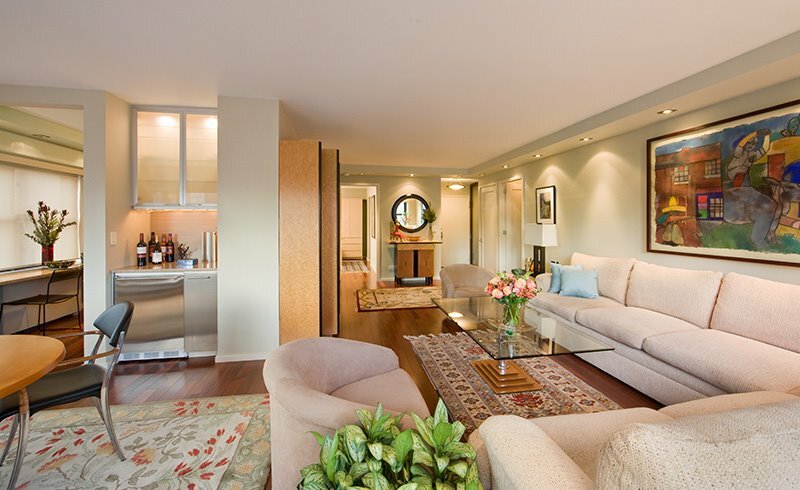 Using floral arrangements as part of your home décor makes your home feel warm and inviting. You can easily complement the design of your furnishings by adding arrangements around the house as accents or as focal points. It’s easy to change the colours for different seasons and adding unique floral arrangements can spruce up an otherwise tired look. A standard place for a floral display is as a centrepiece for a dining room table. You can choose the container to reflect your decorating style. For instance, a uniquely shaped glass container with the right flowers works well for a modern floral arrangement. A basket or pottery style container works well for a more casual look and a classic urn style works well for a more formal look. You can choose the flowers that best fit your decorating style as well as the container. You may prefer to accent colours of artwork you have displayed or choose colours that blend well with your other furnishings. Bright, boldly coloured flowers are great choices for the more modern look. More subdued colours or monochromatic floral arrangements are classically formal. Mixed arrangements can be designed to complement any style or colour scheme. Flowers in a foyer or entryway are a nice way to welcome people into your home. They offer your guests a feeling of true hospitality and set the theme in a pleasant way. 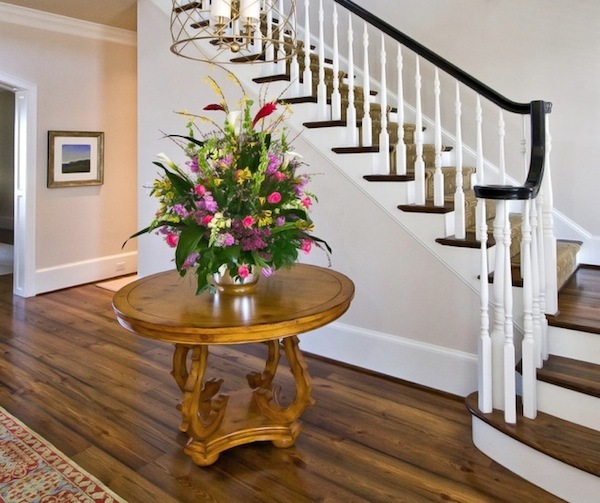 If you have a large, grand style foyer, using a floral arrangement on a large scale can be a great way to wow your guests and it makes a great decorating solution. A beautiful table placed under a prominent chandelier and dressed with the appropriate floral arrangement can make a very visually appealing statement. Flower arrangements with tropical flowers can make large bold pieces for these large spaces. If you don’t have that kind of space, a nice arrangement on a side table is still a great way to invite your guests in. Something as simple as fresh flowers arranged in a simple vase can be just as welcoming as a larger scale arrangement. Fresh floral arrangements can easily be changed out with the seasons or change in colour schemes. You don’t have to save your floral arrangements for inside either. Adding flowers outside your home can make just as much of a welcoming statement as placing them inside. You can find floral arrangements to hang on the front door or to place on a step or porch to welcome your guests to your home. Styles and colors can be changed out for the seasons and give your home real curb appeal. People may not usually think of putting floral arrangements in their bathrooms, but they can add an attractive element to your bathroom design. Simple white or cream coloured flowers in a spa like bathroom can help add to that serene feeling. 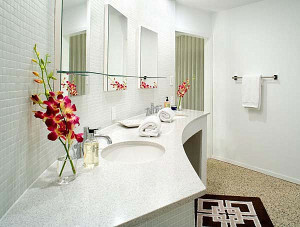 In a guest bathroom, flowers can add that extra touch that lets others know how caring and thoughtful you are. Simple arrangements that go with the colours of towels or accent colours can often be just the right choice to make the look complete. A popular look for the kitchen are floral fruit arrangements. 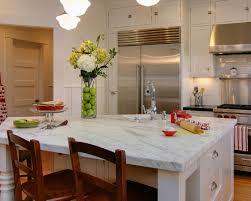 Large or small clear vases filled with fruit and flowers make attractive counter top or table top designs. 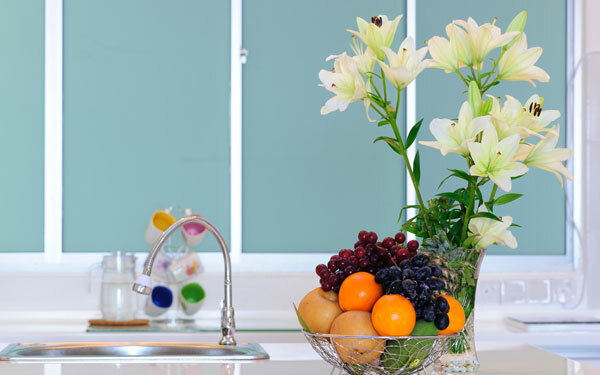 The vibrant colours of the fruit combined with coordinated colours of the flowers make a refreshing look for the kitchen. Even a simple vase of fresh flowers can make a kitchen feel cosy and a place that people naturally want to gather. There are lots of other great places to display your floral arrangements around the house. During the summer, a large, wide floral arrangement can look great setting in front of an unused fireplace. Small, artistic floral arrangements can be placed on bookcase shelves or side tables along with other art pieces or keepsakes. Consider pairing a floral design on a wall table along with a wall mirror to create an eye catching design. Fireplace mantels are another great place for displaying flowers. Simple vases or grand arrangements, depending on the space can be attractive decorating elements. Light, airy flowers anchored in clear vases with rocks or other natural elements are great ways to bring the outdoors into your room and can complement a beachy cottage or casual look. Using unusual containers for your floral arrangements are great ways to add interest to your room. They could be flea market finds or family heirlooms. Either way, they’ll add a unique touch to your room and a one of a kind decorating touch. A collection of vases, all having a single fresh flower or a similarly designed floral arrangement can be a clever way to dress up a table. Old bird cages with flowers inside are clever ways to display flowers. Using floral arrangements around the home offer endless decorating possibilities. You’re only limited by your imagination. Whether you just want to brighten your day with a bouquet of colourful Gerber daisies or define a space with towering containers of Calla lilies, flowers are the perfect way to decorate your home. With so many beautiful flowers to choose from, it’s easy to find an arrangement that will be perfectly suited to your décor or occasion. There’s no excuse to only use flowers for special occasions or holidays. They make great conversation pieces all year round and in many cases, adding just the right floral arrangement can add that finishing touch to your room.